Accuracy is the goal of anyone involved in shooting a weapon. Whether the weapon is a handgun, shotgun, or rifle to be used in self defense, sporting competition, or hunting, placing your shots exactly where you need them to go is likely a high priority and a skill you desire to attain and maintain. There exists a great selection of upgraded fire control groups (single stage triggers, two stage triggers, etc...see our previous blog post for basic info) for the AR-15 in the marketplace right now. These are incredible tools to improve the feel of the fire control parts in your AR and can have a positive effect on accuracy for various applications; however, they are not a substitute for proper technique. Learning proper trigger manipulation will provide you with a skill foundation that can transfer when you are shooting another weapon that does not have this beautiful, upgraded trigger. Increased accuracy in shooting your handgun or bolt action rifle is a benefit you may enjoy if you have learned these basic principles in marksmanship with your "stock" AR-15 trigger. Practice and experience are essential, but practice must be done correctly or it loses much of its value. 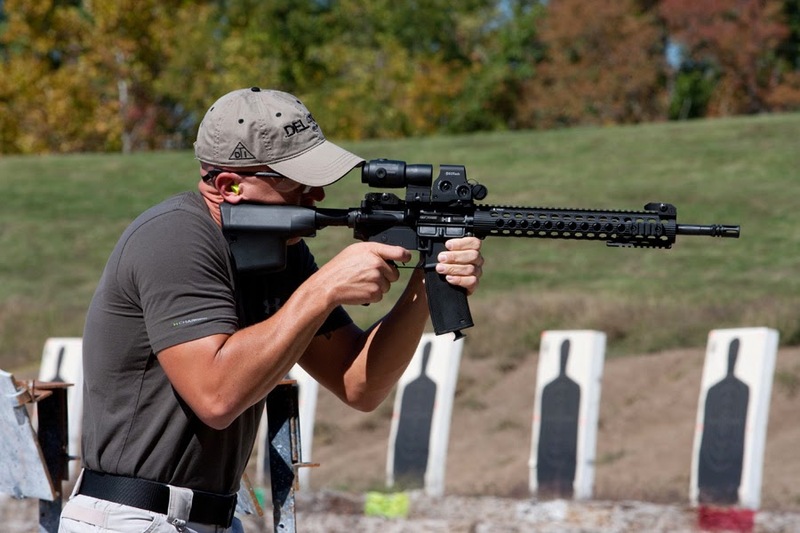 In this post, we will provide some general trigger manipulation techniques for an AR-15 with a mil-spec, standard fire control group that should help you begin shooting well or address any bad habits that have been acquired (and without practice or proper technique, we all are prone to this-marksmanship is a VERY perishable skill). We will start with the interface: for most shooting applications, the "pad" of your index finger (between the tip of your finger and the first joint) is the area that should be in contact with the trigger. Moving too far to the tip or closer to the joint can cause the trigger to not be pulled straight to the rear and may even cant the entire weapon, moving it from point of aim or disrupting a good sight picture. For those new to shooting, or those who have a mil spec trigger that is on the high side of trigger pull weight, this may feel uncomfortable or even difficult. I think this is one reason why an upgraded fire control group is so popular even with those new to the AR platform. As stated earlier, developing the strength in your trigger finger and hand and learning to shoot your AR-15 in this manner will only improve your accuracy with the weapon and other weapons you may fire. Learn your stock trigger first, install that "high-speed" upgrade later. Now, the grip that is on your AR-15 can also have an effect on how comfortable this technique may be and how easy it is to repeat from "muscle memory" if your application prevents you from being able to concentrate on it. We have already addressed various aftermarket grips and their benefits in a previous post, but will spend some time here on the subject because it is pertinent. 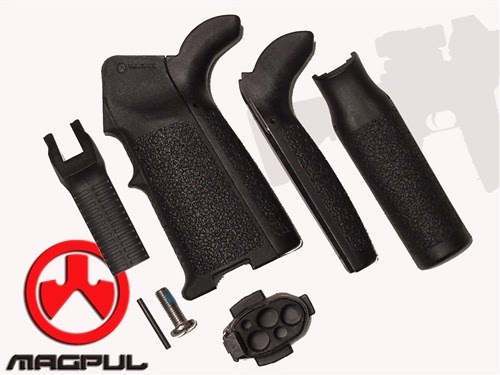 Manufacturers of aftermarket grips offer them in various degrees of angle and size to provide a comfortable grip and proper placement (reach) of the trigger finger for anyone, regardless of hand size or preference. Recent additions to product lines include grips with more of a vertical, (perpendicular to the rifle) angle. 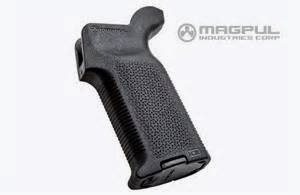 The Magpul MOE K2 grip is a good example of this style and may work well for those with smaller hand size or finger length. Its design is for a short AR-15 PDW type rifle, with a shorter length of pull than a typical carbine or rifle. Standard AR-15 grips have a more "swept back" angle and grips like the TangoDown Battlegrip have a more aggressive angle yet. The Magpul MIAD grip has a traditional grip angle and interchangeable front and backstraps to meet the needs of just about any shooter. With only the pad of your finger touching the trigger, visually imagine it being drawn to the rear to intersect with the middle of the web of your hand at the back of the grip. Slowly and smoothly (slow is smooth, smooth is fast) pull the trigger to the rear. The speed and amount of pressure should stay the same while working on these fundamentals. For focus, mentally say (or verbally, if you want) "smooth, smooth, smooth, smooth..." the entire time until the disconnector releases and the hammer falls. Especially at first, this should come as a complete surprise. After this occurs, keep the trigger pulled to the rear; slowly release the trigger while keeping the pad of your finger in contact with it until the fire control group resets from cycling. Don't release the trigger quickly. By releasing it slow during practice, you can ascertain where your fire control group resets and avoid some of the "take up" you felt during the initial trigger pull. As soon as the group resets, you can slowly and smoothly (in the same manner as before) retract the trigger to fire again. Before following this technique at the range with ammunition, why not practice it at home without? Its free! Make safety a priority by ensuring that the weapon is unloaded (in fact, make sure ammunition is not even in the same area) and be constantly aware of what is beyond your muzzle. If you are inside at home, select a target from something on the wall across the room, and using your desired shooting position, practice this trigger manipulation technique. Focus intently on going slowly and smoothly as you pull the pad of your finger directly to intersect with the middle of the rear of the grip. Now continue to do this, making sure that the weapon is as still as possible throughout the exercise. Finally, while mentally focusing on the pad of your finger retracting the trigger correctly, be sure to visually focus on your sight picture to make sure that while this technique is performed, proper sight picture/sight alignment is not disturbed. Practice this way, a lot. Practice it even when you feel proficient in marksmanship. Practice it before you practice with ammunition on the range. Practice "dry-firing" after you perform these techniques perfectly while sending rounds down range. Perfect practice of marksmanship fundamentals like trigger manipulation and sight alignment makes perfect accuracy. Thanks for reading our blog. If you have any questions about any of the parts mentioned in this post that we offer at www.del-ton.com or the AR-15 rifles we manufacture, please feel free to contact us. In this post, we will give some broad trigger control procedures for an AR-15 with a mil-spec, standard fire control assemble that should enable you to start shooting admirably or address any unfortunate propensities that have been obtained (and without training or legitimate method, we as a whole are inclined to this-marksmanship is a VERY perishable ability). However, a more site https://www.topreviewstars.com/dissertation-writing-service/ having some useful information especially for the students. Must take a look of this site. Thanks to providing this news with us. One of the most parts to learn for a shooter. Your guidance is amazing and defines it very well. This is very helpful news. I really thankful to you for sharing this post. You find qualitative AR 15 Triggers, AR 10 Rifle, Hand guards, pistols, Upper and lower parts for a rifle easily online from moriartiarmaments.com.